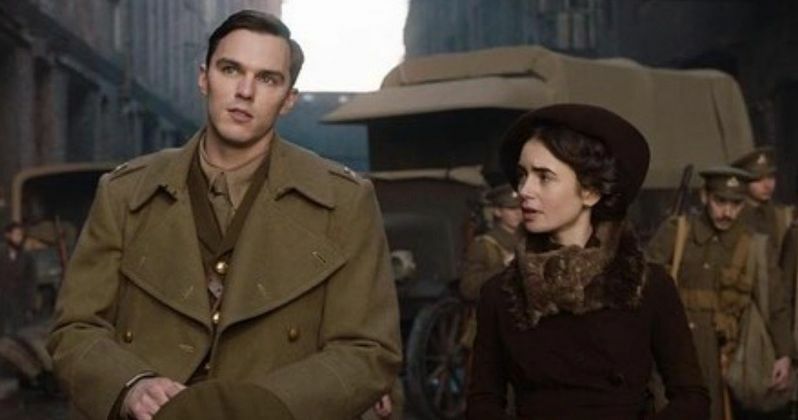 Nicholas Hoult has revealed the first-look images from his upcoming biopic Tolkien. The highly anticipated movie was first announced in 2013, but work didn't really start until 2017. Thankfully, a release date was just announced, bringing the biopic into theaters on May 10th. Now that a release date has been revealed along with the first-look images, a trailer can't be too far behind. Finnish filmmaker Dome Karukoski is on board to direct the J.R.R Tolkien biopic, which will tell the story of the author's formative years. Out of all four of the J.R.R Tolkien biopic photos that Nicholas Hoult shared, the first one is clearly the best. It's a picture of the actor as Tolkien standing in front of a desk with The Lord of the Rings sketches covering all of the walls. The biopic will show his school experiences to the horrifying WWI experiences that influenced the creation of Middle Earth. Additionally the story features Tolkien's long-time love, Edith Bratt, who is played by Lily Collins. Collins can be seen with Hoult in two of the photos. The J.R.R. Tolkien biopic takes place in the early 20th century and all of the clothing and set pieces appear to be from that era. When looking at the first-look photos, it's impressive how the crew were able to nail the hair and clothing styles of the time. However, Tolkien fans are hoping that the movie will show a lot of the author's process when he was creating The Lord of the Rings trilogy and The Hobbit. It isn't clear how much of the creative process that the biopic will show, but it looks like it's going to focus on all portions of his life, giving a well-rounded view of who the author was. J.R.R. Tolkien was born in 1892 and passed away in 1973 at the age of 81. He is best-known for being a writer, poet, philologist, and university professor. But, he became world famous after writing The Hobbit, The Lord of the Rings, and The Silmarillion. Tolkien's work was first attempted to be brought to the big screen in the late 1950s, but it wasn't until 1977 when the animated version of The Lord of the Rings was released. The cartoon is iconic, but it was Peter Jackson's adaptations that hit theaters in the early 2000s when fans were finally able to see the pages fully come to life on the big screen. J.R.R. Tolkien actor Nicholas Hoult is best-known for his work in Mad Max: Fury Road and X-Men. In addition to Hoult and Lily Collins, the biopic stars Colm Meaney, Anthony Boyle, Patrick Gibson, Tom Glynn-Carney, Craig Roberts, Laura Donnelly, Genevieve O'Reilly, Pam Ferris, and Derek Jacobi. Dome Karukoski. Since the Disney and Fox deal should be done by then, the J.R.R. Tolkien biopic might be the first major Fox property that Disney puts out. You can check out the very first images from the biopic below, thanks to Nicholas Hoult's Instagram account.